Origis Energy is Powering the Solar RevolutionSM with custom clean energy solutions for utility, commercial and public sector clients. The Origis team has worked to ensure the interests of all stakeholders are upheld in more than 100 projects worldwide totaling 800+ megawatts to date of developed solar capacity. 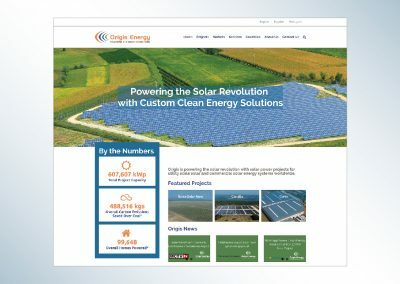 Headquartered in Miami, FL, Origis Energy USA delivers excellence in solar and energy storage development, financing, engineering, procurement and construction (EPC) and operations, maintenance and asset management for investors and clean energy consumers across Europe and the Americas. In 2018, Origis Energy USA completed the first community solar + storage project in Massachusetts. The dedication event had significant visibility. In addition to developing the theme and collateral, we also designed a permanent sign to go on the property signifying the importance of the project.